"What Marie Antoinette Wore to the Revolution"
Last night at Fashion Institute of Technology's K. Murphy Amphitheatre, historian Carolyn Weber gave a lecture centered around her book "Queen of Fashion" (book signing followed). With obvious passion regarding her subject, the Queen of France, wife of Louis the XVI, Caroline crafts a fascinating story about an important part of history: how Marie Antoinette's sense of fashion and her willingness to break the rules of etiquette may have been one of the main factors for her ultimate demise. Marie Antoinette, Queen of France, was born Maria Antonia Josepha Johanna von Habsburg-Lothringen in Vienna. Her coming to France was mainly a political manoeuvre to establish better relations between Austria and France. Shy at first, Marie Antoinette had a hard time getting accustomed to her new surroundings. The obvious discontent of many among the aristocracy for an Austrian-born Queen was no help either. Her first seven years at the Court of France were also marked by the complete lack of intimacy between she and her husband. To distract herself from the loneliness and boredom she endured, Marie Antoinette took to gambling and...clothing. By tradition, she was expected to spend time and money on her attire, and she took to the role with incredible enthusiasm. Her growing fondness for beautiful dresses and the wish to stand out as the most important woman in Versailles saw her sport more and more beautiful clothes, long trains made of countless yards of silk, intricate ladders of thread and lace in the front corsage, panniers (the style had emerged at the Spanish royal court about a century earlier but was still in favor) on each side of the dress to lift the sides of the dress to the level of the hips and contrast even more with the extremely fitted corset which made for the tiniest waists ever possible (with countless accounts of broken ribs, fainting due to lack of oxygen, etc). As Caroline Weber writes "Unlike previous queens of France, who had stayed hidden away at their husbands' court, Marie Antoinette scandalized her fellow courtiers by making weekly trips to Paris, which was eighteenth century Europe's undisputed capital of style. There, she met some of the city's most celebrated designers, whom she enlisted to outfit her in a variety of eye-catching, experimental ensembles..."
Rose Bertin was Marie Antoinette favorite designer, always coming up with intricate swags and folds of fabric which brought the limits of the weight of fabric one could carry around to the maximum limit. At the height of her spending craze, Marie Antoinette was known to have had nearly 300 dresses made annually for her various social engagements. It is said that the ceremonial dressing stage took almost two hours. First came the slip (there were no underwear as we know it), made of cotton, then the cage that would hold the skirt part of the dress, and then corset, the tightening of which was the longest part of the entire process. Finally, the dress was slipped over the head down to its final placement. A time consuming and strenuous chore that had to be repeated more than once a day. 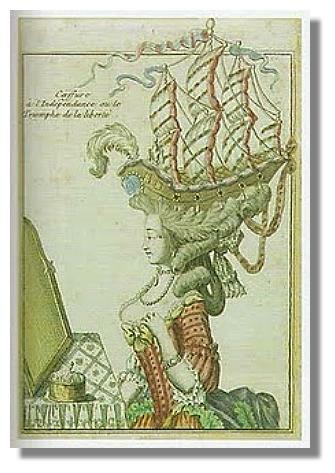 One of the "greatest" innovations brought to the court by Marie Antoinette was her newfound enthusiasm for the "pouf" an elaborate construction made of a pyramidal-shaped structure on which the hair was attached (Monsieur Leonard is the credited inventor of the "pouf"). Along with it were added more natural hair, jewelry, feathers, complete scenes of lifelike people, ships, houses... you name it. Anything that could hold on top of a pouf would be placed there. Above is a picture of an incredible "pouf" made of a ship floating on top of the Queen's head. It was so tall that it had to be taken down so that she could enter the doorway to the place of the party she was attending. Afterwards it was reconstructed once again! Never before had a Queen been such the center of attention. 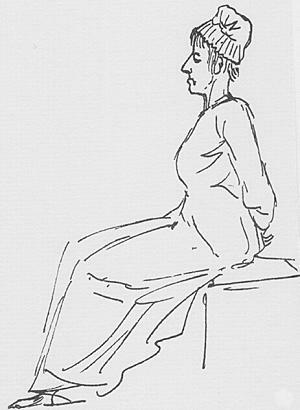 Everyone from all classes of the society waited for the new dresses to be seen and described, sketched, painted, to simply copy as well as could be what the Queen was wearing. Her love for fashion had a strong economic influence: just by herself, she kept about 200 people employed in various industries related to the making of her dresses and her hats and poufs, not to mention her gloves and shoes. She may well be the first public figure to be talked about as much as we currently talk about celebrities of all kinds. She was watched, copied, emulated. Her eagerness to be and feel different showed through her fashion choices. She was daring all etiquette codes when she first introduced the pouf. However, this lead to an enduring craze for the confection, despite many reports of very painful migraines from having to wear such heavy contraptions for hours. If at first, the common French people took a genuine liking to the Austrian, as years passed and her excesses became known, the mood changed. She was quickly nicknamed "Madame Deficit". When she took a new interest into farming and started spending more and more time at the Petit Trianon, her entire wardrobe expanded to include simpler dresses with billowing and delicate front corsages. The fabrics were solid colors, with little sheen to them, and the hats were made of straw, with a single one-colored ribbon adorning them. Her most dramatic move was to abandon the panniers altogether for easy skirts that fell in place simply and, most importantly, were comfortable. The new simplicity was seen as scandalous, even sacrilegious. It created an uproar among the aristocrats as well as the common people. It seems that Marie Antoinette's fashion and lifestyle's excesses and displays were triggered mostly to fight boredom in a place where she didn't feel she belonged, but they only made her an unpopular queen to her subjects. As for the courtiers at Versailles, they took a major dislike to her favoring a very small circle of people who were the only ones having direct access to her. All in all, Marie Antoinette was isolated and disliked, a sad result for a woman who had once wished to be loved by all. On the day of her death, Marie Antoinette was forbidden from wearing her black dress (she was a widow). She took it upon herself to make a final fashion statement. 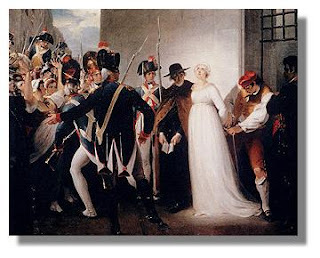 She slipped on a plain, austere white dress (a flagrant dare to the "Republicains" since white should not be worn without the patriotic colors red and blue) and was brought to the place where the guillotine awaited her. The simplicity of her dress was a striking contrast to what most watching her being brought to her death had expected. The most hated "l'Autrichienne" looked so fragile and innocent, nothing like they had envisioned. Silence accompanied her until her head fell into the basket. When the people of the street stormed Versailles and the private quarters of the Queen, first torn into shreds were the magnificent dresses that had made her so popular and so famous in the beginning. Along with it, all mirrors were broken, while the furniture was left untouched: a clear symbol of the populist resentment for a woman accused of having failed the entire kingdom with her extravagances and uncontrolled spending. If Marie Antoinette can be described as the precursor of all fashion leading figures, she is also literally one of the first fashion victims.